Anything and everything. Usually just what pops into my head with none of the 7P's. I haven't blogged for almost a year, but I couldn't let today pass without comment. April 15th 1989 was a bright sunny day. I was 19 a few days later and I was able to get a ticket to the Semi Final of the FA Cup where Liverpool were due to play Nottingham Forest. I went to Sheffield with my Dad and two other people who I only knew through football, one who I had been to Wembley a couple of years earlier. The mood was buoyant, as we had been playing really well and we all expected to return to Wembley to watch the Final. We set off in plenty of time, and had lunch in a pub on the way. Unfortunately, roadworks on the way meant that we got to the ground a bit later than we intended, but in plenty of time for the kick off. Instead of going to the pub we decided to go straight to the turnstiles to get in to the ground. The year before, I had been to the same ground, to watch the same two teams in the same stage of the same competition, but in 1989 things were very different. The Leppings Lane turnstiles were like a funnel shape and there were not many actual turnstiles to get through. In 1988, there was a cordon stopping too many supporters getting to the turnstiles at the same time so there was little pressure on the entrances. In 1989 there was no cordon and we just walked up towards the turnstiles. There was quite a bit of pressure and no real queuing system set up. We had tickets for the stands at the side of the pitch but we were having to funnel through the same area as the supporters who had tickets for the Leppings Lane terrace. I remember as we approached the turnstiles we started to get pushed and shoved and my dad got squashed against a metal bin that was against the wall next to the turnstile. He was still limping as we got through the turnstiles and could see the infamous tunnel that lead to the pens, but once through we turned left and went to our seats. I was sat a few rows in front of my dad just between the half way line and the Nottingham Forest end. Leppings Lane was to my right. The game kicked off and after about 2 or 3 minutes Peter Beardsley, who was my favourite player at the time, hit the bar. This meant that everyone around me was excited. A minute or two later, one of the fans near to me pointed towards the Liverpool end and said that there was a pitch invasion happening. I looked and noticed some fans climbing over the fences, but noticed that they weren't encroaching onto the pitch. Although the football action was at the other end, my eyes were transfixed to the Leppings Lane end. I saw a fan run onto the pitch and talk to Bruce Grobbelaar and moments later a policeman went onto the pitch and spoke to the referee. At 3.06 the game was stopped. A wall of police was put accross the half way line, presumably to stop Liverpool fans attacking the Nottingham Forest fans. However, the Nottingham Forest fans had realised that this wasn't football violence, but the police in that line weren't helping to save lives but were told to stop an event that wasn't happening. The first thing that made me understand what was really going on was when I saw a fan walk past me down the side of the pitch holding his arm. His arm was broken so badly that it resembled a letter Z.
I started shouting at the police on the half way line to go and help where the problem was and not to be standing doing nothing. The next couple of hours lasted a lifetime and yet seemed to blend into one moment. I watched one ambulance crawl around the perimeter of the pitch to the area where it was most needed and then watched it crawl around the other side of the pitch taking away the injured, dead and dying. I watched as supporters broke up the advertising hoardings and used them as makeshift stretchers. I watched as supporters struggled to keep the arms of the dead from flopping off the hoardings. I wanted to go to see my dad so I left the area were I was sitting and went back onto the concourse beneath the stand to go up to the next set of steps where my dad was sitting. I had to go past a row of bodies that had been layed out there. That image still haunts me whenever I think of Hillsborough. I don't know what time we decided that we should try to make it back to Merseyside. As we were leaving the ground we asked a Fireman if he knew how many were dead and he said he didn't think there were any fatalities. We stopped part way back from Sheffield when we saw a telephone box that didn't have a massive queue. I phoned my Grandma who was audibly relieved to hear my voice. I reassured her that all of us who had gone together were safe. The car journey home was in silence. I don't even remember if we put the radio on to listen to the reports of the tragedy. I can only remember silence. When I got home, I immediately went round to my Grandmas and my Auntie and her gave me the biggest hug possible. My best mate was there as well (an Evertonian) and the relief on his face was obvious as well. We had arranged to go out that night to celebrate my upcoming birthday. He told me that we didn't have to go if I didn't want to. I felt like I had to. We went to a club half way up Bold Street in Liverpool. I remember the DJ giving updates throughout the night on how many casualties there were. One of my other friends met a girl that night and he thought he was in. I started to talk to her when he was at the bar, just to talk to someone. I'm grateful that she listened to me and I have never met her since but it was good to be able to talk to someone who didn't know me. The next day my best mate came to our house fairly early. You could get up early after a late night when you were 18. He said he had heard that the club had opened the gates at Anfield and would I like to go down. When we got there, there wan't even a queue. I managed to put my hat on the Kop goal post and tie my scarf to where I usually stood on the Kop. By the time we left, the queue was round the stadium. I was numb for a few weeks after Hillsborough. 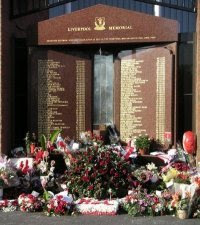 I remember getting a bus to town one day and noticing a funeral of one of the 96 taking place. I got off the bus and went to the funeral even though it was of someone I had never met. Because of the events of that day it is now a lot safer to go and watch football in Britain. But as the new verse says, "Why so many taken on that day?" I'm not a Red and was only 9 when this happened, but reading that brought the event home to me more than anything on the news or tv. Need somewhere to get it off my chest. This could be it. I'll write about whatever comes into my head, nostalgia, remeniscing, sport, music, being a parent, anything but work really. 96 - It's more than just a number. To Quote Sgt Pepper, It was 20 years ago today. Mini Me's in more ways than one. Ian Strom 2010/11. Awesome Inc. theme. Powered by Blogger.